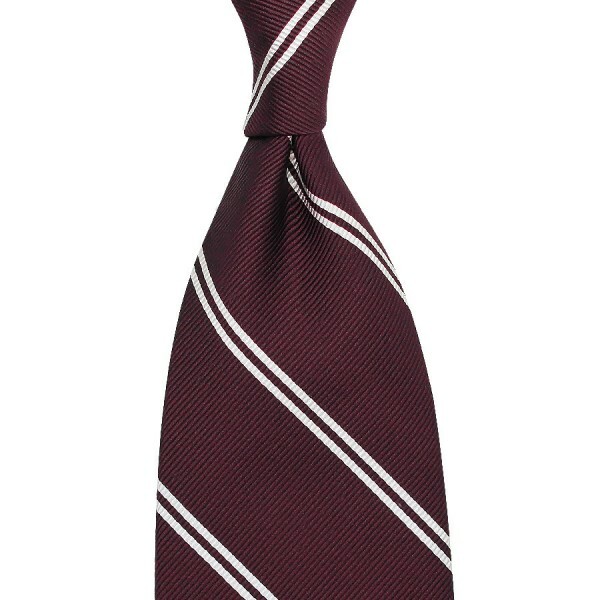 Product information "Double Bar Repp Stripe Silk Tie - Burgundy - Handrolled"
Burgundy repp tie with white double bar stripe. A design as simple as it is beautiful. Works just as well with a light grey flannel suit, white shirt, Edo No Hana pocket square, brown braces and brown fullbrogues as with a combination of green tweed jacket, blue/white striped shirt, Omoide pocket square, brown braces, grey flannel pants and brown suede oxfords. Just like normal repp silk, this is characterized by its deep, ribbed structure. The reason this is called “super-repp” becomes apparent once you look at the backside: normally, the weft (usually navy) can be seen shimmering through, so that the colors will become a bit muted. With super repp, this is not the case, which is especially nice with an untipped, hand-rolled tie. Also, this variant is more matte, drier, than regular repp; just as we like it. Related links to "Double Bar Repp Stripe Silk Tie - Burgundy - Handrolled"